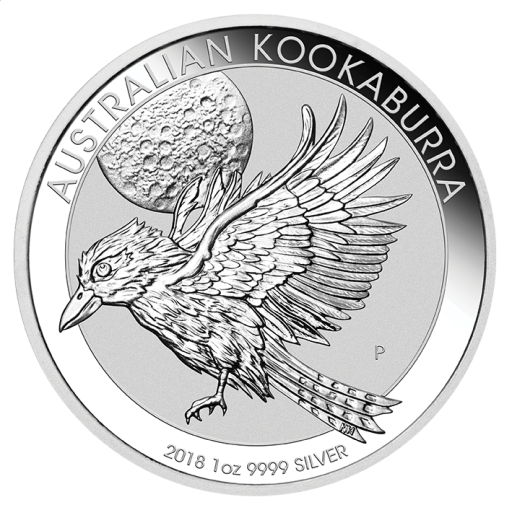 The 2018 1oz Silver Kookaburra is a smart buy for coin collectors and investors. Issued by the Perth Mint in Australia, this striking coin - the latest in its longest running collection - is valued for its .9999 purity and its annually changing reverse design. Collectors and investors are sure to appreciate the intricate details that set this beautifully designed coin apart. For 2018, the Perth Mint's artists have chosen to show the Laughing Kookaburra in full flight with the moon in the background. Collectors may be interested to know that this delightful Australian native isn't nocturnal and, although it's the largest member of the Kingfisher family, it doesn’t seek out areas close to water. The bird is a widely recognised symbol of Australia that has appeared in countless stories and songs and it can be heard all over the bush thanks to a distinctive call that sounds like human laughter. It's one of two species of kookaburra native to the continent along with the Blue Winged Kookaburra. This exquisite 2018 1oz Kookaburra is certain to be the highlight of your collection and it's also ideal for those looking for 99.99 silver investment coins that are expected to retain or increase their value. The 1oz 2018 coin is ideal for those who are new to the Silver Kookaburra series as well as for avid collectors who don't want to miss the latest edition. At coininvest.com we are committed to finding the best products for both new and established collectors – like this 2018 1oz Silver Kookaburra. Fill in any gaps in your collection from our range of Silver Kookaburras or explore our entire collection of silver bullion coins at your leisure.